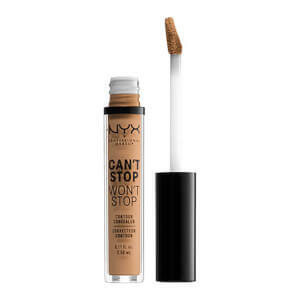 Discover weightless, comfortable coverage with Can't Stop Won't Stop 24 Hour Foundation from NYX Professional Makeup. The waterproof, richly pigmented formula comes in a range of shades to match most skin tones, while the creamy formula glides onto skin like silk to create a smooth and even complexion. Staying put for up to 24 hours of wear, the foundation helps to control shine for a seamless, salon-worthy matte finish. Suitable for normal, oily, combination and sensitive skin types. Non-comedogenic. This foundation is an incredible dupe for Nars radiant longwear at a fraction of the price. I apply it with a stiff brush but then go over lightly with a beauty sponge and find that gives the best coverage and finish. 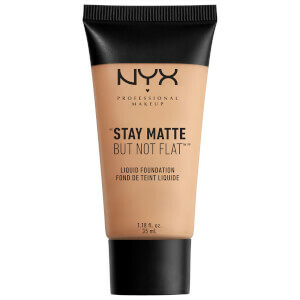 It’s medium coverage that you can build to full with a second layer and it doesn’t cake. Lasts all day and i don’t see any deterioration even through a 12 hour day! Just as it says in the description. It covers pretty well. It's not heavy and I can wear it all day long without obviousl signs of shining (which was the problem with all the previous foundations; I have a combination to dry skin with oily T-zone). Highly recommended! 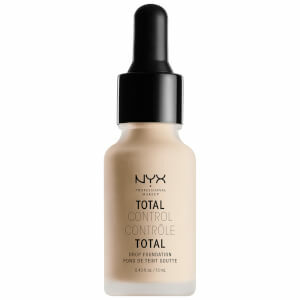 This foundation lasts a long time without taking off makeup all day long ~ the key is that it's cheap and makes me look beautiful!